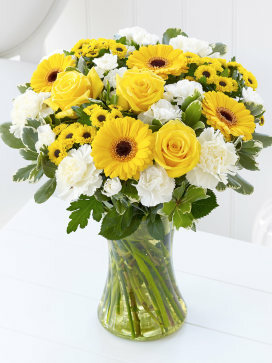 Enjoy our sunny new arrangements and make a splash with colour palettes chosen to transform any mood. The colour your Day with Beauty vase is a stunning display of bold colour to give to your friend or loved one, a gift that reflects their own unique charm and grace. This is such a pretty combination of purple with fresh whites and greens-some of our favourites arranged in a beautiful coloured vase. An incredible gift that they will love. Pink: Perfectly conveys the fresh feeling of love, friendship and warmth. The Colour your Day with Happiness vase blooms with blushing sweetness to offer your loved one a gift of charming cheer. This is a beautiful combination of our favourite flowers. 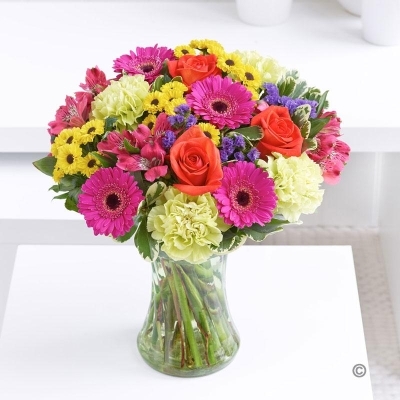 This vase arrangement is a fabulous gift that is sure to bring happiness to their day. Red: Expresses romantic feelings of love and affection. The Colour your Day with Love vase is bursting with crimson hues to create the perfect gift for your sweetheart. 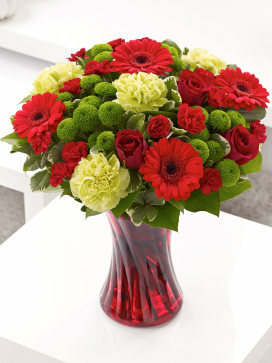 A selection of beautiful blooms in shades of red and lime green to create an arrangement to take their breath away. The perfect gift to create a romantic moment. White: Delivers renewal and joy with its serene palette of serene and harmonious tones. The Colour your Day with Joy vase is a beautiful display of crisp whites and lime greens to give your friend or loved one a feeling of bliss. This is a very elegant vase arrangement. 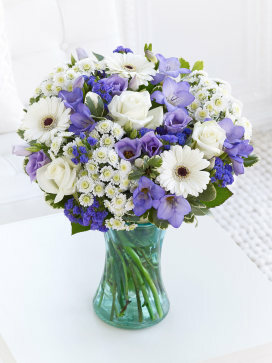 A selection of favourite flowers in white and cream create an incredible gift that they are sure to delight. Yellow: Brings a cheerful energy to any environment, uplifting the spirit with its spark of sunshine. The Colour your Day with Sunshine vase is blooming with bright cheer that will uplift your friend or loved one at ever turn. 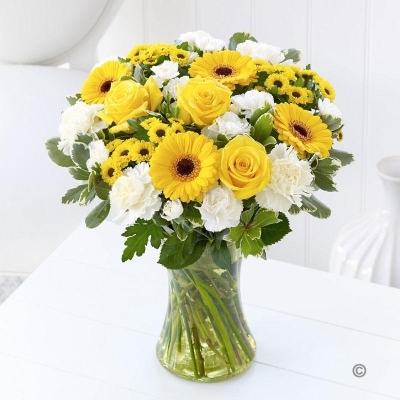 A selection of favourite flowers in vibrant yellow are combined with fresh white, cream and green to create an arrangement sure to convey your warmest wishes.